I have been involved in campaigning and advocacy efforts for refugee rights for more than 20 years, ever since I became a refugee, fleeing the war in Bosnia. When the war in Syria started, the news of it brought back my trauma, as the destruction of many Syrian cities and the people trying to survive look very much like my own experience of the siege of Sarajevo. It is hard to believe that five years have passed and we have not yet found the way to peace in Syria. The sense of powerlessness and anger has been overwhelming for me. I am sad to say that I know from experience how it feels for Syrians here who still have relatives trapped back home. In 2014, I started working on a campaign to provide protection to more Syrian refugees in the UK. The campaign was organised by Citizens UK in the run up to the General Election in 2015, and we asked each local authority to take just 50 refugees to increase the number of resettlement places from a mere 750, which is all that our Government offered at the time. The progress was slow, and the mood among campaigners was not very optimistic, as our extremely negative discourse on immigration holds back efforts to provide protection to refugees. I felt that, as advocates, we were doing our best, but that we were nowhere near close enough to creating meaningful change. But then Alan Kurdi died. The image of his body on the beach provoked decent people around the world to speak out and start doing something to end this tragedy. 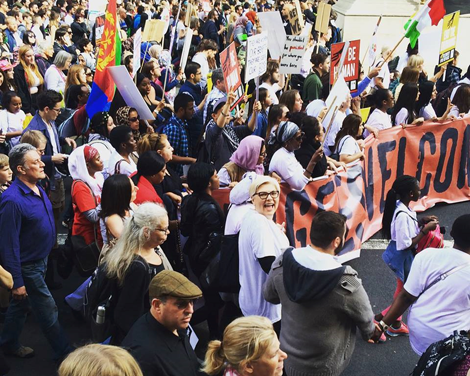 Citizens UK rose to the challenge by organising the Refugees Welcome movement and we are now working hard on the introduction of community sponsorship visas to provide safe passage to more people. The Syria Solidarity UK campaign was very helpful in this process of keeping the issue alive and building a network of various campaigns and Syrians already here, as well as the new arrivals who can speak authentically and legitimately about the situation in Syria and urge action to bring the war to an end. The 12th September march through London was a powerful expression of goodwill and solidarity with refugees and Syrians, and it was a true privilege to be asked by Syria Solidarity to be one of 100 refugees carrying the banner and leading the march. That march, along with many other campaigning efforts, moved our government to increase the resettlement quota to 20,000 Syrians. There are many challenges ahead of us and the temptation is to try to do too much. One thing that I, from my Bosnian experience, can share with fellow Syrians is: do not wait for the war to end to start thinking about peace—start preparing for peace now—organise, develop leadership in the diaspora, build consensus among various groups and start lobbying for justice infrastructure to deal with war criminals. 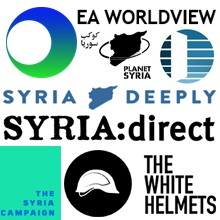 Until that happens, the Syria Solidarity UK campaign can continue to create the space and support efforts to have a better informed debate about what is happening in Syria and what potential solutions are required to end the war and to help refugees who are stranded around the world to find protection and safe routes to countries of asylum. 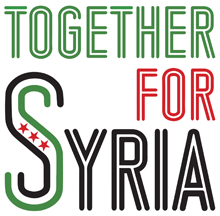 Equally importantly, Syria Solidarity UK can continue to be a much needed space for British and other people of goodwill who want to show solidarity with the plight of the Syrians and offer them support to work for peace and provide protection to those who managed to flee. Zrinka Bralo is Chief Executive of Migrants Organise. She is a human rights campaigner and former refugee from Bosnia.